Ship's bells have been used for centuries in order to tell the passengers as well as the crew what time of the day it was. This kept daily tasks in order as well. 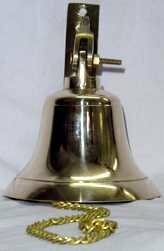 These ship's bells are available in 4 inchdiameter. They are made from brass like the traditional bells.Mounting Bracket and Hardware Included. 4 Pcs Handmade Cow Goat Sheep Solid Brass Bells 2 1/2"